Kirsty McGee is a Manchester based singer-songwriter and guitarist. Early apprenticeship in various bands saw a later swing to folkier climes, but still keeping something of an edge to her lyrics. 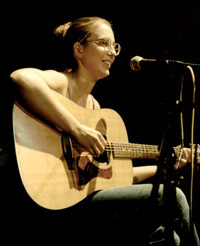 Her first album "Honeysuckle" was produced by John Wood and Clive Gregson and saw Kirsty in the nominations for the Horizon award (best newcomer) at the BBC2 Folk Awards. Kirsty is currently at work on her second album which is to be produced by Boo Hewerdine. "Enchanting delicacy...uniquely well-crafted songs. Her debut album is destined to become a classic." "McGee's songs have been compared to a wide range of artists from Joni Mitchell to Beth Orton and are a melodic mixture of intense emotion and relaxed delivery." Triste: You were recently nominated for the Radio 2 Folk Awards in the Horizon category for up-and-coming folk acts. But your influences are a little wider than some other folk acts, aren't they? You didn't come from a purely folk background did you? Kirsty McGee: I guess I finally came round to the idea of 'folk music' in a very roundabout way. I grew up listening to bands like The Smiths, The Cure and The Sugarcubes and songwriters like Billy Bragg and Michelle Shocked. I had a certain amount of secondhand Dylan and Leonard Cohen coming in but it wasn't until much later that I discovered people like Joni Mitchell, Guy Clark, James Taylor and current favourites like Nick Drake and Tom Waits. I was always interested in good songwriters I guess rather than particular bands but I didn't really get interested in 'folk' until comparatively recently. Triste: believe you played in various groups before you started to play solo. Kirsty McGee: I was in a few indie bands before I started playing solo. Mainly crashing electric guitars and simple lovesongs or quirky lyrics. I put out a few compilation tracks and a couple of singles in the states but nothing serious. When I came back to Manchester from Sheffield in the mid nineties I tried putting a band together here but the closest I got to a release was a demo called 'Rock n Roll' that came out in 2000. There were only fifty copies made in hand-sewn packages so in a way it was quite fun. Each one had an individual zip that was a bugger to sew in and a handwritten lyric book printed on tracing paper. Triste: What made you change across to become a solo singer-songwriter? Kirsty McGee: I started playing on my own after I moved to Cornwall in August 2000. There weren't many musicians around and so I became a lot more self-sufficient and taught myself to fingerpick. Financially speaking it's a lot cheaper to work solo than to work with a band and so it kind of stuck. Having said that, there are plans to tour with a three-piece band next year which I'm looking forward to - probably double-bass and electric guitar...It's important to be able to play on your own I think since it gives you a bit more strength when it comes to working in a band. Triste: Your debut album "Little Things" was released by Ugly Man records a couple of years ago. I haven't heard it, so how does it differ in terms of content from your latest release? Kirsty McGee: Little Things was never actually released by Ugly Man. There were about sixty pre-release copies knocking about at the time (I don't have one myself) but the label never quite got it together. The album was very raw. Just me and guitar mostly, with various people adding bass, mandolin and electric guitar. The recordings are quite scrappy so I'm actually quite glad it didn't come out! Triste: People are always keen to categorise musicians and in my opinion the music you play could be said to fall between two similar, but different artistic stools. On the one hand you've got the acoustic singer-songwriter types - your Tom McRae or Gemma Hayes types, who would never be considered for any folk awards - and you've got the Kate Rusby and Bill Jones types who would rarely feature in a mainstream music magazine like Q. Which camp do you lean towards? Kirsty McGee: The problem with labelling things is that it makes everything too convenient. Labels can become limiting very quickly so that if you think you enjoy 'acoustic' music you don't bother to look in the 'folk' box and so on. I'm kind of aware that I don't fit easily into either category...but there's a bit of a grey area between folk and pop which is the whole singer-songwriter thing and I guess I'd probably slot into this rather than anywhere else...At the end of the day I'm not so bothered about what I'm classed alongside so long as it doesn't effect anyone's access to the music I make. Triste: How do you like playing folk clubs now compared to the pubs you played in previously? Kirsty McGee: Folk clubs are very different from the clubs and pubs where I used to play. I write very quiet, delicate songs and it's hard to get this kind of material across when you're singing through a bad pa in a noisy, smoky bar. The first time I played a folk club I was scared stiff because everyone shut up and listened. Since then I've learnt that folk audiences expect you to talk about the songs as well as just play them so I've had to learn to be a bit more of a performer. I have a love-hate relationship with playing live. When it goes well,of course I love it, but I suffer badly with nerves which makes performing hard sometimes. I guess if I didn't love playing more than I hated it I wouldn't be able to do it but I'd be lying if I said I found it easy. Triste:You list a fair few musicians in the thanks section of your album. Have you gained a lot from playing with other artists? Kirsty McGee: I've learnt a lot from playing and touring with people like Clive Gregson, Boo Hewerdine, Kristina Olsen, Jez Lowe and Robb Johnson. People have been very patient with me and put up with my not knowing where anything is or how anything works! I've been lucky to have been able to share some time with these people and I've done a lot of watching and listening over the past couple of years. Triste: How did you come to make the album Honeysuckle with people like Clive Gregson and Boo Heweredine and with John Wood as producer? Kirsty McGee: Clive and Boo share the same agent as me so that's how I met them. As for John Wood, he happened to be working for a regional arts board up in the Scottish borders and we came across him by chance. He was interested in the songs that I was writing and when I heard that he'd worked with people like John Martyn and Nick Drake I was keen for him to produce the album. It was only once I knew that I might be working with him that I cast around to see what he'd recorded and discovered he was actually quite 'famous'. Triste: How much say did you have over the arrangements on the record? Were you trying for any particular feel? Kirsty McGee: When we started working on the album I wanted to make another Nick Drake album - with strings and lush instrumentation - but unfortunately the budget wouldn't stretch to strings and arrangements so we opted for more of a 'band' feel. I like the '70s organ sounds, the viola, the piano and the wonderful guitar washes that Neill came up with but sonically the album was a bit of a surprise for me! Triste: Were any of the songs written for the album? Kirsty McGee: Not really. I had a backlog of songs stretching back a year or so. Some came from 'Little Things' and some were written whilst I was in Cornwall but I didn't write anything specifically with the album in mind. Triste: Where do you get the influences for your songs? Kirsty McGee: I write a lot of lovesongs based more or less on personal experience. I guess on the album the exceptions to this are The Tuba Player's Wife which was written in a classical music rehearsal room with a noisy brass player next door and Skin which was written in my dad's village in Spain inspired by the local custom of painting pigeons and letting them out to fly in the evening. If anything, the songs are just me trying to make sense of what's going on around me or in my head and heart or else expressions of a dark sense of humour! State of mind probably affects the songs as much as location, but having said that, living in Cornwall and city centre Manchester and spending time in Spain have all given me different images to draw from. I spent a lot of the time looking at the sea in Cornwall so many of the songs which I wrote down there are full of sea imagery. By contrast, a lot of the Manchester songs are full of broken glass and city things and the Spanish songs are flooded with sunlight...I think you can write songs whatever the location just so long as there's time to spend alone playing the guitar. Triste: You play flute on the album. Was this your first instrument? Kirsty McGee: I played flute from when I was about nine until I was about eighteen and more recently took it up to play along with people on the 'songwriters' tour and on the album. I started to play guitar when I was about nineteen because I wanted to play in bands and at the time I was worried about the whole stereotype of the talentless girl singer!... I also took up guitar because I wanted to write songs! Triste: How was the Radio 2 Folk awards show? Kirsty McGee: It was scary and fun at the same time. I was told it would be a really dressy do and so I had this beautiful dress on and when I got downstairs almost everyone else was wearing torn jeans or dressing down so I felt like I stuck out like a sore thumb. Still we had a very nice meal and listened to some great music and got to stay in a posh hotel. It was really nice to be included at the end of the day. Triste: What are the plans for the next album? Any changes in style in the offing? Any directions you want to pursue further? Kirsty McGee: We're planning to record the next album in the autumn, possibly with Boo Hewerdine producing. We've got designs on one or two possible musicians and I have a lot of the songs already written. There's a bit of a French chanson influence creeping in here and there because I've been listening to a lot of French song and if I had the money there'd still be strings everywhere...but on the whole I think the album will feel a lot simpler than the last one. On July 17th/18th, Kirsty heads back up North to the Brampton Live Festival where she has been a regualr feature over the last few years. She will be appearing alongside Karine Polwart (of Malinky), Kellie While (of E2K) and Abbie Lathe (of Maddy and The Girls) as part of 'The Women's Word'. This ad hoc grouping will reunite as part of Folk In The Fall at The Purcell Rooms in London on November 7th. Throughout the Summer Kirsty wil be playing a series of gigs around the country visting Penzance, Ulverston, Crawley and Allendale among other places. Frost Kirsty's second album, was released on March 8th. Featured on the record are, amongst others, John Spiers, Neill MacColl, Mat Martin and the album's producer, Boo Hewerdine.